Ron’s Carpet and Air Duct Cleaning provides the utmost in tile and grout cleaning in the Upstate area of South Carolina. Don’t take chances by having your tile and grout cleaned by amateurs. Trust the experts at Ron’s to know how to bring the sparkle back to dingy tile without damaging your valuable investment in your home. Let us show you why our 6-step tile and grout cleaning process sets us apart from the competition. Call us today at (864) 297-6440 or contact us online to schedule service. A solution designed especially for ceramic tile and grout will be generously applied to the floor. This cleaning agent penetrates the grout breaking down dirt, grease, cooking oils and spills. Special solutions will be used for tough spots. Our high-powered, truck-mounted equipment will thoroughly rinse the floor, whisking away the loosened dirt and grime. 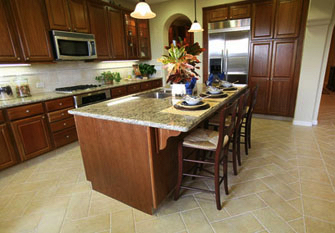 Purchase a good quality dust mop and sweep your ceramic tile floors daily. This is especially important in new installations where the grout has not fully cured. Dirt, mud and sand tend to grind into the grout from heavy foot traffic. Shower stall and tub enclosures should have proper ventilation. Stagnant water breeds stain-causing mildew as well as other fungi. 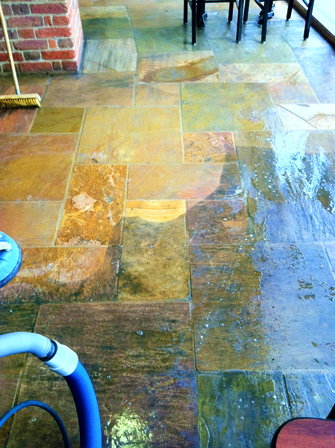 Many tile cleaners are acid based and their use should be limited. Always read the manufacturer’s label to find out. All acids, no matter how weak, will etch marble surfaces. Natural marble is commonly installed as thresholds in doorways and is also installed in window sills and shower curbs. In addition, avoid any cleaner that contains harsh abrasives.